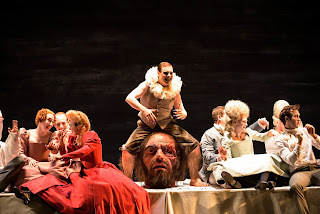 Barrie Kosky's much anticipated new production of Handel's Saul opened at the Glyndebourne Festival on 23 July 2015, Kosky's debut at the house and their first production of Saul. Though not an opera and never intended for the stage, Handel's oratorio Saul is one of his most dramatic works and Kosky created from it a remarkable piece of theatre. A strong cast was led by Christopher Purves as Saul, and Iestyn Davies as David, with Lucy Crowe as Merab, Sophie Bevan as Michal, Paul Appleby as Jonathan, John Graham-Hall as the Witch of Endor and Benjamin Hulett as Abner, High Priest, an Amalekite and Doeg. Ivor Bolton directed the Orchestra of the Age of Enlightenment from the harpsichord. 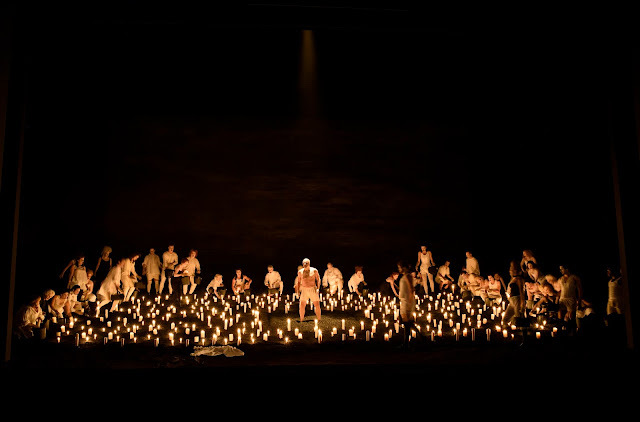 Designs were by Katrin Lea Tag, with choreography by Otto Pichler, and lighting by Joachim Klein. Handel's oratorio Saul was premiered in London in 1739. It has a libretto by Charles Jennens, who not only wrote the libretto for Messiah but was responsible for some of Handel's most remarkable dramatic oratorios. The piece was intended as theatre of the mind, though premiered in the theatre it was performed in concert but Handel's scores include stage directions clearly indicating the way his mind worked in these circumstances. What a piece like Saul gave him was a sense of real narrative clarity, this was a story everyone knew and which had a clear development from beginning, middle to end, very different from the convoluted scene based drama of the opera seria, where it was the effect of individual scenes which mattered rather than the (sometimes ludicrous) progression from scene to scene. Handel's response was a dramatic meditation on the story, sometimes action proceeds at lightening pace (in the Glyndebourne programme book Barrie Kosky talks of the way, freed from da capo arias, Handel sometimes write music of extraordinary concision), but then there will be a long chorus when the action is frozen and the chorus almost steps out of the drama to consider it, and talk about it to us. This gives the director remarkable freedom, there is a lack of specificity about the dramaturgy which can be filled in many ways. Of course, there are problems; you have to find something to do during the long choruses with all those singers on stage, and something which has a dramatic coherence and does not look like decoration merely added in. 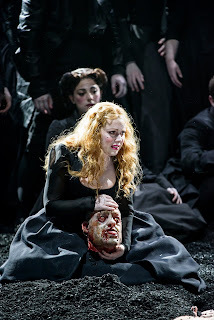 In 2012 I saw two very different stagings of Handel's Jephtha (Frederic Wake Walker's at the Buxton Festival, and Katie Mitchell's at WNO) which showed quite how responses to the drama could vary. If I say that Barrie Kosky had clearly listened to Handel's music and created a piece of theatre based on it, then that is intended as a great compliment as too often I get the impression that directors stage the libretto rather than the musical drama. Kosky, designer Katrin Lea Tag and choreographer Otto Pichler created a semi-abstract, coherently thought through response to the music. Kosky and Ivor Bolton drew some remarkable performances from the singers and players. One of the themes that Kosky identified in the piece, which his staging brought out strongly, was the King Lear like resonances with a King who goes mad, and two warring daughters. Kosky had increased these resonances by conflating the small roles of Abner, the High Priest, the Amalekite and Doeg into a single fool-like role. 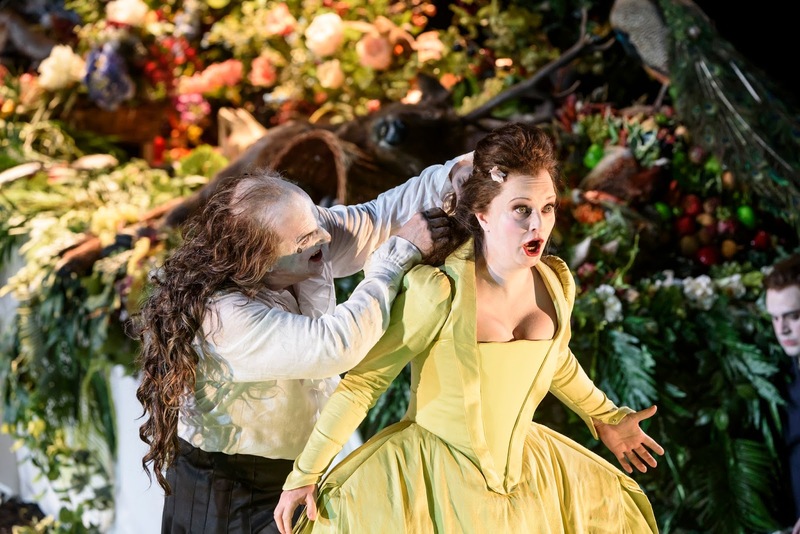 I say advisedly that this was a remarkable piece of theatre because though Handel's score was at the very core of the piece, Kosky had added two elements to it which gave the staging some of its specificity (and added the Marmite element too, you either loved or hated it with little in between). First the sound, the whole piece had an extra aural sound-track ranging from the whoops and cries of the chorus, through the communal thumpings, bangings and shoutings, to the shouted extra dialogue and Saul's ravings. Some of this was a response to the drama going on in counter-point to the music, for instance when Saul presented Merab to David she was furious and Saul and Merab had an encounter which, not in the score, was performed in dumb-show but with the odd sound which intruded on the music. Also, there were many moments when you felt that Kosky did not find Handel's music quite enough, and needed to add something. The results added up to an extra aural component which was present enough for me to find unsatisfactory and disturbing. If you listen to a radio broadcast of the performance then you are likely to find it slightly strange at times. The second element was visual, dance played a large part in the whole performance. There were six dancers who made a strong element to the overall drama. But Otto Pichler's choreography extended to the singers too so that whatever you thought of his visual language, he and Kosky had folded movement into the whole ensemble rather than just adding a couple of dancers for window dressing. Like everything else in the production, this was the result of strong, thoughtful decisions which I appreciated. Unfortunately, I did not respond to Otto Pichler's visual vocabulary and found the dance element neither expressive nor stimulating, feeling that his perky, energetic choreography rather trivialised the music. The evening opened with a series of visual coups. First the overture was played with the curtain down, with just a huge bloody head of Goliath visible, definitely a big plus point. Then as the curtain opened we saw Iestyn Davies as David, stripped to the waist, bloodied and clearly traumatised, then suddenly the rear curtain rose to reveal a huge table set for a feast (like the 16th century Dutch still life printed in the programme book), on which the chorus was sitting and standing. For the opening sequence the chorus moved, in stylised way on this table and then the ensemble developed with the dancers coming on. Costumes were neo-baroque, creating an exotic, slightly a-historical feel and in the huge wigs and overdone white make-up, creating a sense of parody too. The whole piece took place in this space, with it plain walls and the floor of artificial earth (clearly this season's must-have for directors, following on from Covent Garden's recent production of Rossini's Guillaume Tell). The dinner interval was after the Act Two duet for David and Michal (O fairest of ten thousand fair) and its subsequent chorus. 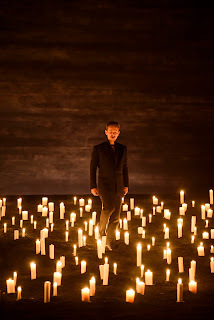 The second half opened the symphony and formed a clear divide with the second part as the dark part, opening in darkness with a field of candles and with the performers now dressed in black. Though the visual language for the production was strong and pervasive, and at times I found it to be hyper-active, Kosky was responding to the music and when demanded gave us simplicity. David's singing of his aria to sooth Saul, and then quietly cradling him whilst the harp played, or the Dead March performed with a stage strewn with bodies but no other accompanying action. And whatever you thought about the visual language, Kosky drew some truly remarkable performances from his cast. Christopher Purves' account of the title role was truly Lear-like, as he depicted Saul's complete descent into madness. The occasional mad episodes in the first part turning into complete ravings in the second. It was a truly fearsome and mesmerising performance, and Purves was gripping in his singing of Handel's music (Saul hardly gets a proper aria, the role is almost all recitative and arioso). But the performance came at some cost to the music, as Purves created the sense of madness by distorting the vocal line (thankfully only occasionally), and by adding extra spoken contributions to create intense theatre. Iestyn Davies as David was slightly cool, calm and unreadable. He started with David traumatised and shell shocked, and there was a sense in which the character took most of the piece to recover from the opening drama with Goliath. This was counter-parted by the cool beauty of Davies' singing and his account of O King, whose mercies are numberless was one of the highlights of the evening. But David's character is also puzzling because of the dramaturgy of the piece, as he develops strong relationships with both Jonathan and with Michal. 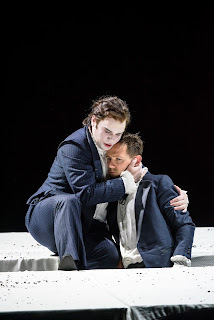 Kosky's production gave a clear sexual element to the relationship with Jonathan (with the two in a steamy clinch at one point), but offered little in the way of explanation except to suggest that David was an opportunist schemer. But the beauty and intelligence of Iestyn Davies performance helped to bring the role alive in multiple ways. Lucy Crowe made Merab a far more interesting character than can sometimes happen, and Crowe's plangent tones, thrilling and beautiful yet extremely calculated, meant that even when at her most vicious we responded to Merab in a way. The bleached plangency and technical perfection of Crowe's performance of Merab's music ensured that the contrast with the two sisters was played up as Sophie Bevan's Michal was all bubbly, running-around excitement. From the first moment Bevan set eyes on Davies, it was clear that Michal was obsessed with David and Bevan really brought this over. She was a complete delight in the arias, bringing a real sense of charm. The young American lyric tenor, Paul Appleby was new to me. He brought a strong sense of interior drama to Jonathan, he too was very taken with Iestyn Davies' David from the first moment and their relationship was developed and played out very clearly. In that sense he made a fine component to the drama, but Jonathan is perhaps an underwritten role and Appleby did not manage to make the music really count. He sang effectively, but without the specificity of the other performers and I have to confess that I found his phrasing a bit lumpy at times. Benjamin Hulett was truly brilliant as the new fool-like character, welding his sequence of almost random arias into a clear role and having an omnipresent theatrical effect which gave a strong counterpoint to the drama. We never did work out why he was given artificially large bare feet (we have to assume that Hulett's real toes are not that size! ), perhaps to give a sense that this is a Pan-like observer and commentator. His interventions, and arias sung to the audience brought a real feel of extra commentary to the drama and his music performance was spot on and certainly showed him ready to take on larger roles. Thankfully the role of the Witch of Endor was cast with a man, as it should be, and John Graham-Hall brought a wealth of experience to the role. Kosky seems to have seen the scene in Lear-like blasted heath terms. By now Christopher Purves' Saul was stripped to his boxer shorts and John Graham-Hall's witch appeared out of the ground and was an old crone also stripped to the waist with huge pendulous breasts on which Saul sucked, and the voice of Samuel spoke through Saul so that Purves sang both roles. It created an incredible piece of theatre from what is one of the strongest scenes in the oratorio. The hard working chorus was amazing, singing Handel's taxing, large-scale choruses with both strength and expressiveness. For the more serious ones, such as the big jealously on, their range of movement was restricted as Kosky clearly wanted us to concentrate on the music and there was a great deal to enjoy. For the livelier choruses in Act One we were treated to the sight of them dancing and singing, and this did on occasion cause some instability in the ensemble, but overall this was a powerful, strongly sung account of one of Handel's finest oratorio choruses. 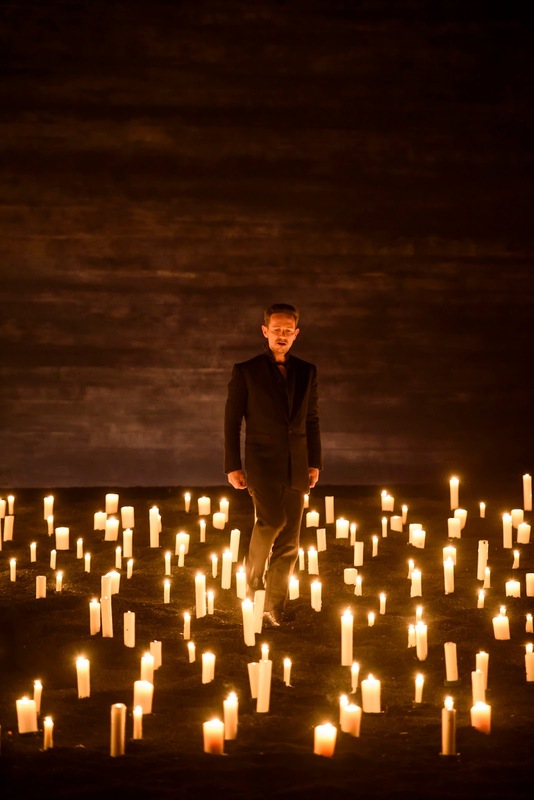 The organ solo in the symphony which opened part two was performed by James McVinne, on-stage and costumed playing a chamber organ on a platform spinning round in the midst of the field of candles - just one of the visual images which was inexplicable yet stunning. In the pit the Orchestra of the Age of Enlightenment, with continuo from Luise Buchberger (cello), Chi-Chi Nwanoku (bass), Paula Chateauneuf (theorbo), Luke Green (harpsichord) and Bernard Robertson (organ), were directed from the harpsichord with aplomb by Ivor Bolton. He drew strong, characterful playing from the orchestra and the work gave plenty of scope for individuals to shine, but also clearly gloried in the varied sounds of Handel's orchestra. Barrie Kosky has a very distinctive theatrical language and the big virtue of his production of Handel's Saul was the way he used it unashamedly but always expressively. 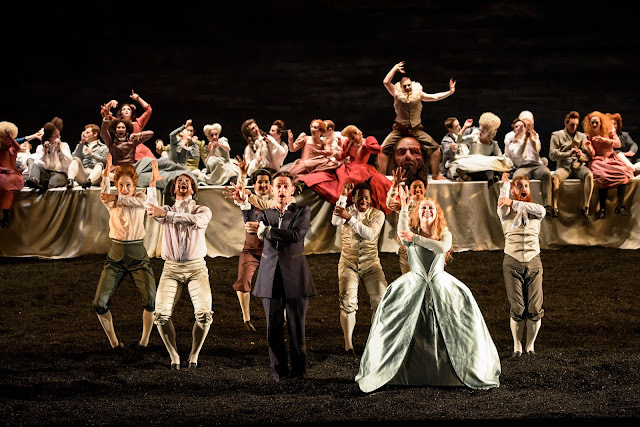 The first night audience at Glyndebourne reacted extremely positively, and clearly enjoyed some of the elements (such as the dancing) which I found more disturbing. This was a truly memorable event, as Kosky and his collaborators and cast had created a strong theatrical event, really bringing Handel's theatre of the mind to life on stage.